Great Ocean Views-No Oceanfront Prices! This house has the BEST OCEAN AND BEACH VIEWS without paying oceanfront prices! Once you stay here, you won't know that you weren't oceanfront & your bank account will thank you! Get more bang for your buck with the ULTIMATE home for a relaxing family beach vacation. This beautiful DESIGNER DECORATED home is just steps from the beach and every attention to detail. You have lots of options on how to spend your days-- you can lounge by it's private backyard POOL, take a few short steps to the beach or swing in the hammock. Those will be the hardest decisions you make all week in this well-appointed home. This LUXURY home has stunning views from each of its 4 decks-- on the front and back. From the rear decks, you can listen to the ocean from a rocking chair or swinging hammock or take in the intercoastal and gorgeous sea grass at sunset from the front decks. You won't find better OCEAN VIEWS at any house off the beach. This home was not built to rent-- what that means to you is beautiful furnishings and that 'right at home' feel. It's not like any other on the rental market! Choose from TWO MASTER SUITES-- one with a king-sized bed and large private bath and deck access and the other with a queen bed and private bath. All 4 bedrooms feature their own private bath and personal designer decor. It's DIRECTLY ON A BEACH ACCESS-- making your days on the beach even easier. 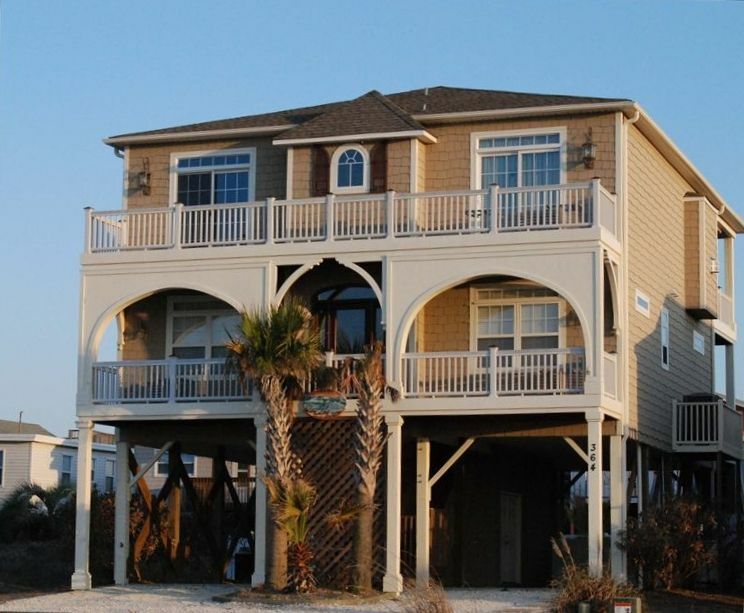 If you've ever been to Ocean Isle, then you know distance from beach access is key! It doesn't get better than this unless you pay Oceanfront premiums. You won't waste time walking blocks down for beach access! Plus, this property has all the comforts of home and more. Inside and out, you have the luxury of listening to the state-of-the art stereo system, which includes full surround sound for late-night movie watching. The TOP FLOOR's SPACIOUS LIVING AREA boasts a 10 seat extra-large family dining table and comfortable sectional sofa as well as gourmet kitchen-- all with tons of windows to catch views from every room. The breakfast bar has four extra seats for big family gatherings. You can also have your taking in the breathtaking ocean views at the teak table (which also seats 10) dining chairs on the top deck or just sip your morning coffee as you rock in one of the many rocking chairs on all the decks. As an added bonus, there's a second family living area on the first floor where kids can retreat, watch TV or play. It also has a pull-out sofa and direct access to a full bath as well. You name it, this luxury home has it all. This is great FAMILY-FRIENDLY and KID-READY home. Kids can play in our POOLSIDE Sandbox. You'll find beach toys, TWO BABY MONITORS, a FULL-SIZED portable crib, highchair/booster seat, toys, games, kids movies, and MORE. We've thought of everything to make your vacation the BEST VACATION you've ever had. You won't want to miss this GORGEOUS beach home. We know you'll be ready to come back again and again after just one stay. Take a look at what other families had to say about our home in the guest comments. We have views of the ocean and the beach... not just the ocean like most homes that aren't oceanfront. Additionally, having views of the Intracoastal and the ocean are almost unheard of. We have outstanding views from both the front and rear porches of our home. Rare DOUBLE-SIDED VIEW. See the ocean and the beach from the back and see the intercoastal waterway from the front of the fabulous 2nd row beach home. See the beach AND the ocean! Rare find unless you are ocean front. Off the beach, you usually only see the ocean. But you can see the beach and the ocean from our main level rear deck! Even has a desk area to put your laptop so you can stay connected to your email! All stainless appliances, granite countertops, pantry. Oven also has warming drawer-- great for cooking for large families. Well-equippped kitchen. Great Kids Video selection and a few for the adults too. (4) 4 decks maximize all the views. Main upper deck includes large family dining table and lots of rockers for relaxing. Rare double-sided view directly on beach access. The TOP FLOOR SPACIOUS LIVING AREA boasts a 12 seat extra-large family dining table and comfortable sectional sofa as well as gourmet kitchen-- all with tons of windows to catch views from every room. The breakfast bar has four extra seats for big family gatherings. You can also have your morning coffee taking in the breathtaking ocean views at the teak table with dining chairs on the top deck. As an added bonus, there's a second family living area on the first floor where kids can retreat, watch TV or play. It also has a pull-out sofa and direct access to a full bath as well. You name it, this luxury home has it all! This house will satisfy Parents and kids alike. Our ULTR KID-READY home has a POOLSIDE sandbox,an outdoor toddler/baby swing, beach toys, (2)baby monitors, FULL-SIZED portable CRIB, convertible booster or HIGH CHAIR, games, kids movies and MORE. This home was wonderful! Beautifully decorated and well stocked, lots of deck space with a very large table for outdoor eating, and nice beach access. We would definitely rent this house from this owner again. The large outdoor table IS perfect for the whole family to sit and enjoy meals and fellowship. We are so glad you enjoyed our home! We would love to have you back! Thanks Arnold family! This home was absolutely wonderful! The location was perfect with a beautiful view and quick access to the beach. It was clean, well kept, and comfortable. The toys in the downstairs living area were an added bonus. The owner was friendly, easy to get ahold of, and great to work with. I can't say enough good things about it! Highly Recommended. Awesome house with all the amenities. Great place for small children especially with the pool. Spent all day at the beach and then the kids spent the rest of the day in the pool. No need to constantly keep the kids entertained. The pool took care of that. We were able to relax ourselves. Beach access from the house is great, close and flat. No steps or boardwalk to get over the dunes. Even though this house is on the third row of houses (second street back) it has a perfect view of the ocean from the top deck, which includes a familly size table and very relaxing rocking chairs. Owner is very accessible and responsive to making sure your needs are met. We just returned from a long weekend in this home. It is beautifullly decorated, clean and well organized. Its representation on this site is accurate. It's very close to the beach, has excellent views and has a nice pool that our kids loved. We ate every meal on the back deck overlooking the ocean. We are avid beach lovers and this was one of our favorite homes. The owner was pleasant and easy to work with as well. We will definately return! Our stay was wonderful. We had our sons and their families with us - there were 10 of us. . The grandchildren rank from 14 down to 6 and they all were happy with the area and things to do. We enjoyed the house, the pool, the beach, and the rockers and view of the ocean on the upper deck.. The area is clean and safe and we enjoyed ourselves completely. Our daughters-in-law did the cooking and found the kitchen to have everything they needed. The property is clean and well taken care of. The house is just as it appears in the listing and we would definitely do it all over again! This is one of our families favorite beach houses to stay out. The picture perfect view of the ocean and the private pool make for a relaxing escape. The house is always kept in great shape and there is probably not a better decorated beach house on the island. A short walk to the beach and easy access to local restuarants and golf make this the perfect getaway. Looking forward to our next visit!